Yellowstone is so big, it’s smart to try and cluster your experiences in different parts of the park each day. The 142-mile Grand Loop Road leads to most of the major park landmarks. Be sure to look closely at the park’s schedule of ranger-led programs (see nps.gov/yell). They may determine where you want to be when. Paint pots and rivers. Drive north on the Grand Loop Road to the Lower Geyser Basin and Fountain Paint Pot, then continue on to Madison and beautiful views of the Firehole River from Firehole Canyon Drive. Hey Ranger! At Norris, the Museum of the National Park Ranger takes a fun look at the traditions of the men and women who make the national parks run. Even more geysers. No, you won’t be tired of them. 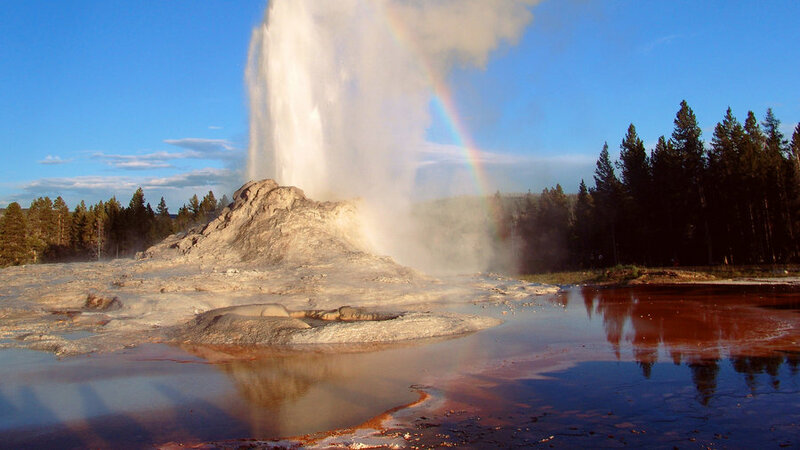 Anyway, Norris geyser basin has some terrific examples, notably Steamboat Geyser, tallest in the world, and also the interesting Norris Geyser Basin Museum. Volcano 101. The newest visitor facility in the park, the Canyon Visitor Education Center focuses on Yellowstone volcanic geology, with a film, Land to Life, a room-sized model of the park, and the world’s largest lava lamp. Grandest Canyon. Artist Thomas Moran’s paintings of this canyon, with its Upper and Lower Yellowstone Falls, helped make Yellowstone a national park. One look and you understand why. The canyon is one of the great sights in the world, and the only bad thing about it is how hard it is to tear yourself away. Short trails lead to observation stations at Inspiration Point and Lookout Point. Lake life. At Bridger Bay Marina, rent a kayak or canoe and venture out onto Lake Yellowstone. Wild world. North of Lake Yellowstone, Hayden Valley is one of the best places in the park to see wildlife―bison, elk, coyote, grizzly bear―especially early in the morning and again toward dusk. Breakfast at a grand hotel. Less elaborate and less well-known than Old Faithful Inn, Mammoth Hot Springs Hotel is historic (built in 1937) and charming. After breakfast, be sure to take a peek at the Map Room, with its map of the U.S. made from 15 types of wood. (See Yellowstone restaurants). Seriously steamy. At Mammoth Hot Springs, Yellowstone’s volcanic energy is expressed in super-heated spring water cascading over a series of sculpted limestone terraces. See the park past. The Albright Visitor Center & Museum, a beautiful red-roofed building left over from the era of the U.S. Army’s Fort Yellowstone. Inside are exhibits on the park’s Native Americans, early explorers, and the U.S. Army’s role here. Towering falls. Take the Grand Loop Road east to the Tower-Roosevelt area of the park. From here you can see 132-foot Tower Fall, among the most beautiful in the park.